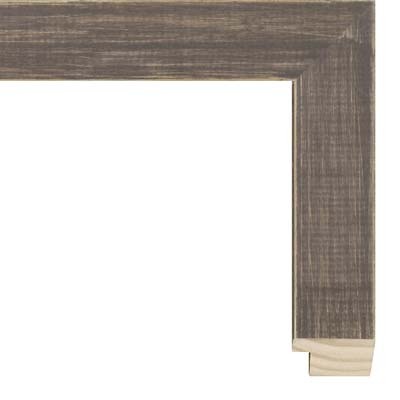 This rustic, country chic style picture frame features a washed and scraped finish over finger-joined soft wood, with additional wear along the edges to simulate a soft yet rugged look. The profile is 1 ½” wide, with a flat, rectangular shape, and a ½” rabbet depth. This picture frame is a soothing choice for nature art and country farmhouse decor, including wedding portrait photography, prints, posters, original fine art landscapes, and watercolors. For a unique DIY project, consider using this style to create a collection of small wedding party favors by attaching a name plate to a small-sized frame, with names and a wedding date. When you receive prints from the photographer, you could send one out to each guest, so they can have their own framed copy of your wedding photo. Additional themes that pair well with this rustic, country picture frame are coastal, cottage, and beach designs or genres, due to the weathered look and feel of this frame. In this sense, the feel of this chic country frame is also light and uplifting, as it begs the viewer to escape. Peaceful images of leaves, trees, and other vegetation might also offer a Zen feeling in context to this frame.